I just wanted to say thank you once more for this blog. I don't comment terribly often but I always love to see a new post show up in my RSS reader. I never know what new and interesting thing I'm going to learn but there is always something. I knew when Big Brown was injured you would have the scoop, and sure enough you're on top of it. Keep up the great work. Awesome pictures and details...I enjoyed the article very much. 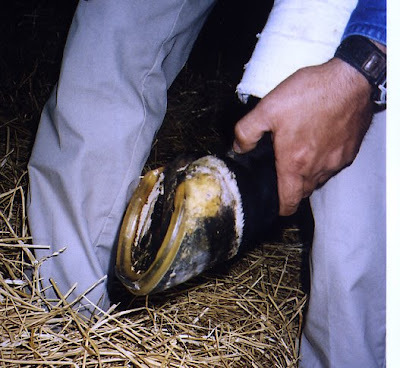 Wow, I have so much to learn, and you are providing lots of super material that will come in handy when my friends ask, "Do u know anything about hoof problems. Thanks for another information article. Thank you so much for this really in-depth explanation and information. 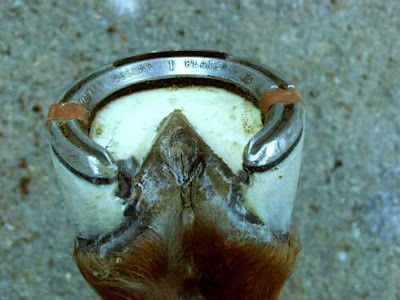 I am a lifelong horse lover, but have only been riding and become really involved in the last 2 years. I kept waiting for the newspapers to offer a more detailed explanation. Then I checked my blogger Dashboard, and there you were with all the information. I am learning so much from your blog - thanks again. 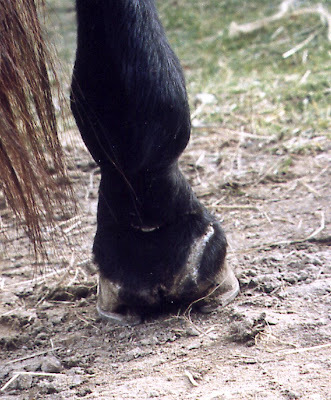 No heel contact with the ground suspends the entire back of the hoof and thus the coffin bone in a very precarious state. 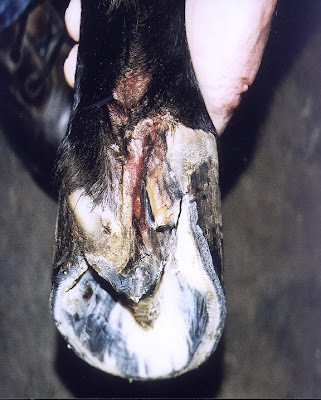 During full weight bearing on the hoof, the peripheral loading that happens to the hoof wall causes trauma, and the heels end up jammed instead of supported from underneath. 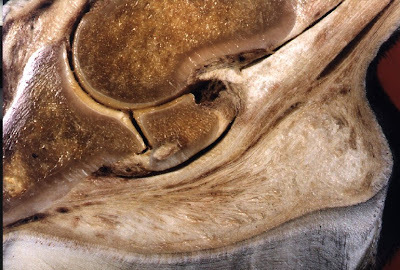 Add an assault from the outside (either an overreach or a hit from another horse) and that adds more complications to tissue that is already compromised. A bare foot doesn't lie, and the frog is active in support. Best of luck Big Brown.....you are amazing!!! !